From ancient etchings on cave walls to crude stone deities and talismans to modern-day granite tombstones, man has been fascinated by stone engravings. Stone is a readily available material, and it can last for many centuries. The methods used to engrave stone have changed over the years, and now carvers can be much more precise in their etchings. Choose a stone to engrave. 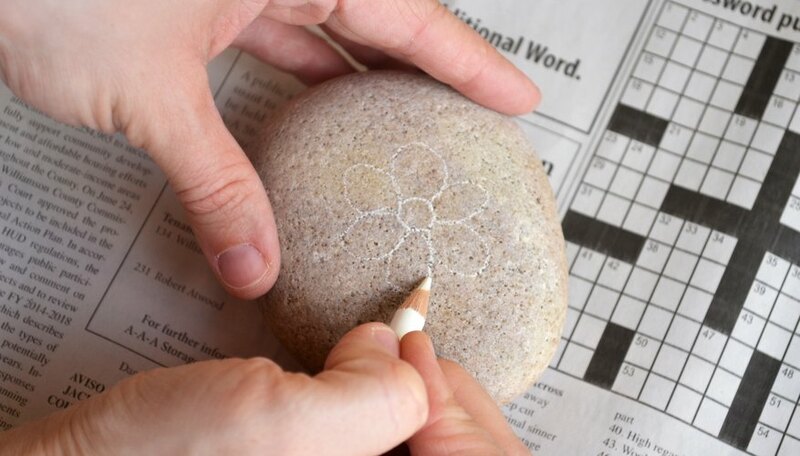 For beginners, a stone with a flat surface, such as a river rock, is easier to etch. Cover a sturdy table with old newspapers. Draw a simple design on the flat surface with a china marker or wax-based pencil. Remember that etched lines will be lighter than the original color of the stone. Put on your safety goggles. Select a ball tip appropriate to the width of your design and insert it into the electric engraver or rotary tool. Slowly and with light pressure, trace the outline of your design. Take your time and get the "feel" of how much stone is whittled away with each small pass of the ball tip. Use a cone tip to engrave detail lines. Add shading and dimension to your design using a cylinder tip. Remember when shading to engrave your lines in a natural direction. For example, if engraving a long daffodil leaf, engrave the shading from the tip to the base of the leaf in the direction of the veins, not from the left to the right or vice versa. Use a damp rag to clear the dust from the stone's surface so you can see what you have accomplished so far and what you have yet to do. Wash and dry the rock when the image is completed. 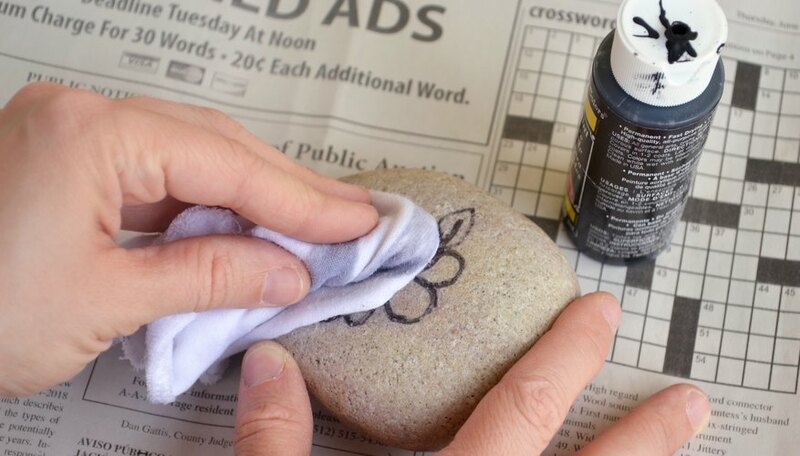 To bring out the detail, you may fill in depressions on the light-colored rock with black latex paint. Wipe off any excess with a damp rag. For dark-colored stones, try white paint to make the image "pop." 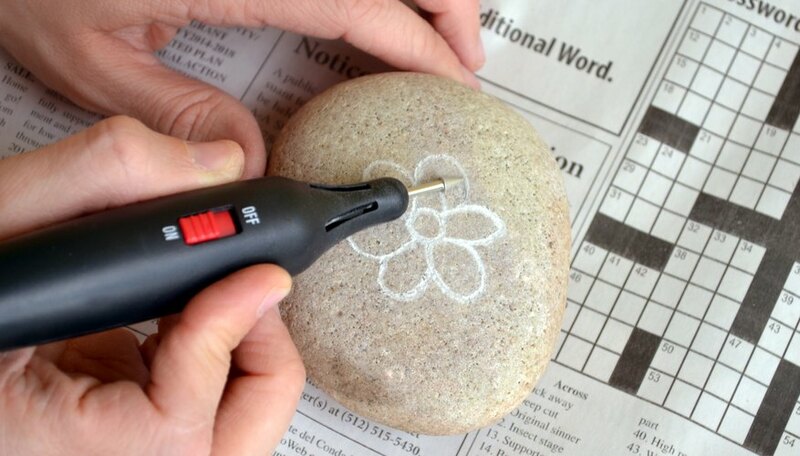 For large rocks with large images, you may wish to experiment with rubber stencils that you stick to the rock's surface before sandblasting the image on the rock. This type of engraving is a popular method used on headstones. Modern laser engravers are often used to engrave both words and images on granite monuments; such machines are computer-driven and are quite expensive. Be sure to wear eye protection to avoid eye injury from flying bits of rock. If using an electric engraver with diamond tips, read all the instructions beforehand and ensure the tips are firmly seated in the engraver. If you choose to try sandblasting, be sure to do it outdoors and away from any surfaces you do not want to be harmed, such as cars or windows.